Hospital’s Joyful@healthy Workplace Programme was awarded as the highly commended submission in the ACHS Quality Improvement Awards 2018 under non-clinical services delivery category. 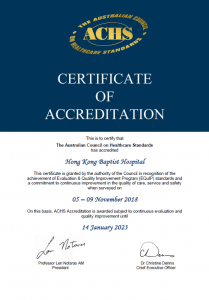 The programme was published in the Quality Initiatives – the 21st Annual ACHS Quality Improvement Awards 2018 publication, for sharing with healthcare service providers around the world. 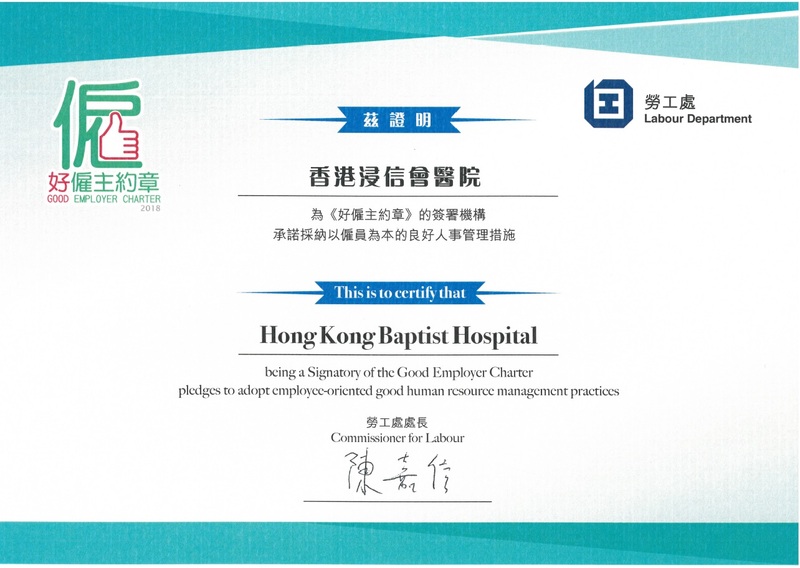 HKBH has been recognized by Labour Department as a “Signatory of Good Employer Charter 2018” for our commitment to adopt employee-oriented good human resource management practices. 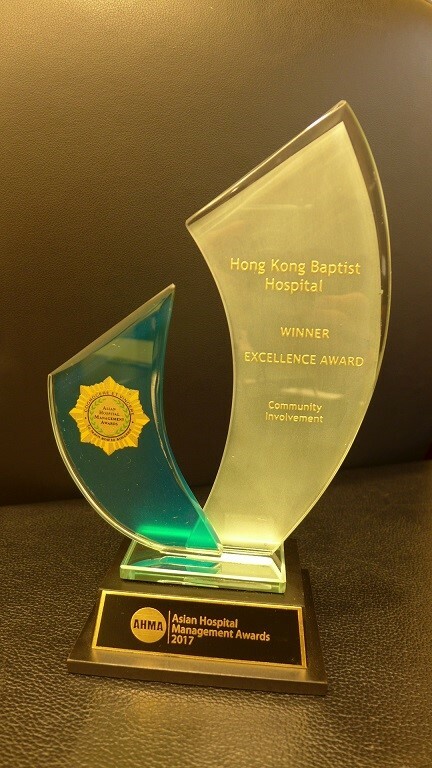 The Hospital’s "Building a healthy community" initiatives was named Excellence Winner in the Community Involvement Project category in Asian Hospital Management Awards 2017. Block E of the Hospital achieved Bronze rating under BEAM Plus V1.1. for New Building by The Hong Kong Green Building Council. Hong Kong Baptist Hospital (HKBH) volunteering team participated in the CIIF-funded project - The Choi Wan Good Neighbour Health Network (Phase II) - Cross Generation Social Capital Building Project. Though cultivating the capacity of caregivers, parents and school teachers, the exercises enhanced the health awareness of school children and building health capital. 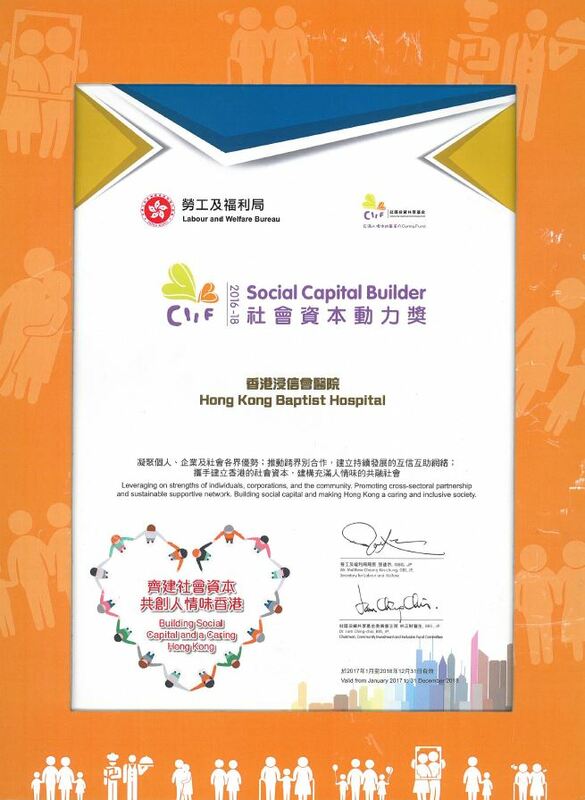 The good deeds of the team was recognized by the Labour and Welfare Bureau of the Hong Kong SAR Government. 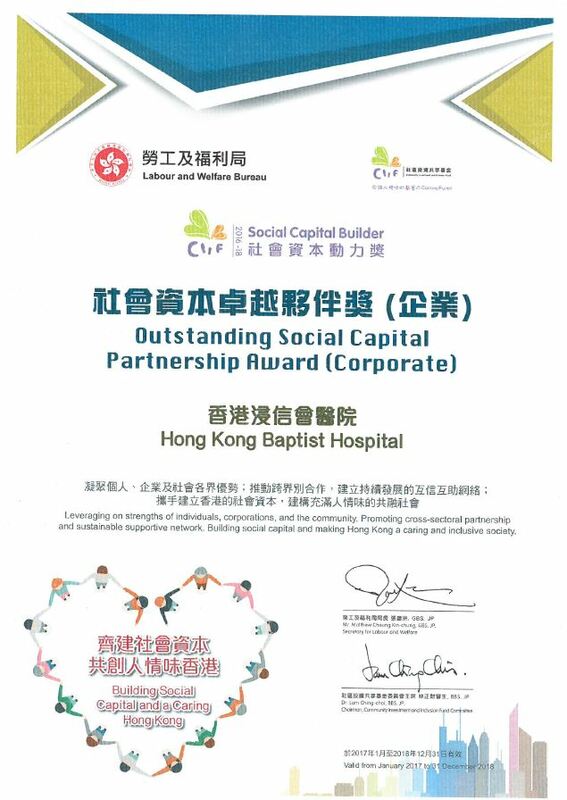 The Hospital won the Social Capital Builders (SCB) Award in 2012, 2014, 2017 and Outstanding Social Capital Partnership Award (Corporate) (2014 & 2017). 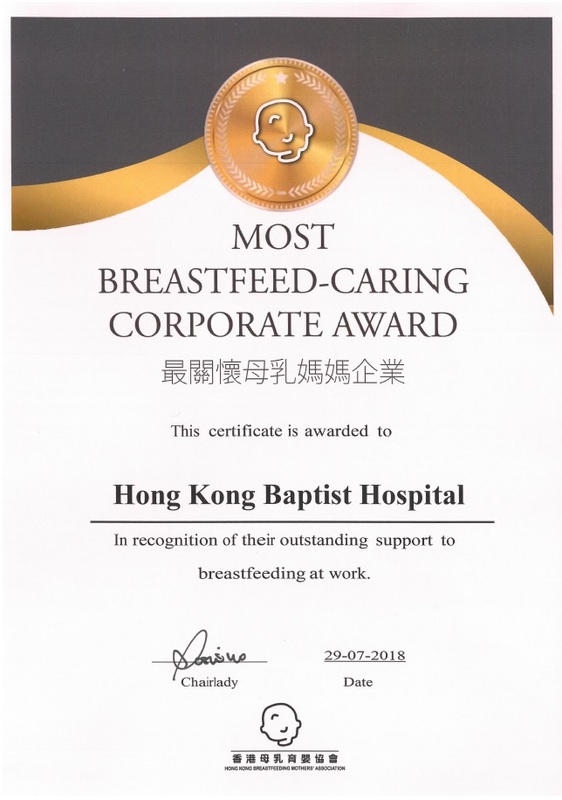 HKBH has been awarded for “Most Favourite Lactation Room Award (2017)” and “Most Breastfeed-caring Corporate Award (2018)” by the Hong Kong Breastfeeding Mother’s Association in recognition of our outstanding support to breastfeeding in the workplace. Received Platinum Award in Charter on External Lighting by Environment Bureau in recognition of the Hospital’s efforts in minimize light nuisance and energy wastage. 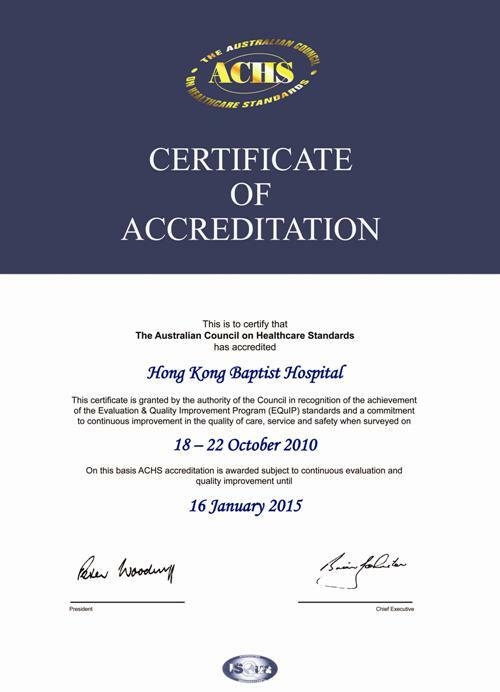 Hong Kong Baptist Hospital has been awarded a Certificate of Appreciation in recognition of our commitment to promote a Breastfeeding Friendly Workplace by pledging support to the ‘Say Yes to Breastfeeding’ campaign organised by the Hong Kong Committee for UNICEF (UNICEF HK), the Food and Health Bureau and the Department of Health. 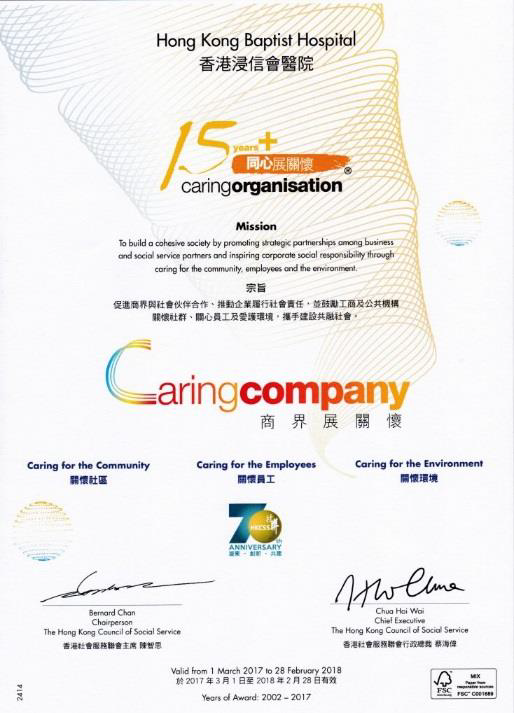 Hong Kong Baptist Hospital is awarded the 15 Years Plus Caring Organisation Logo by The Hong Kong Council of Social Service this year in recognition of the Hospital’s commitment in Caring for the Community, Caring for the Employees and Caring for the Environment over the past years. 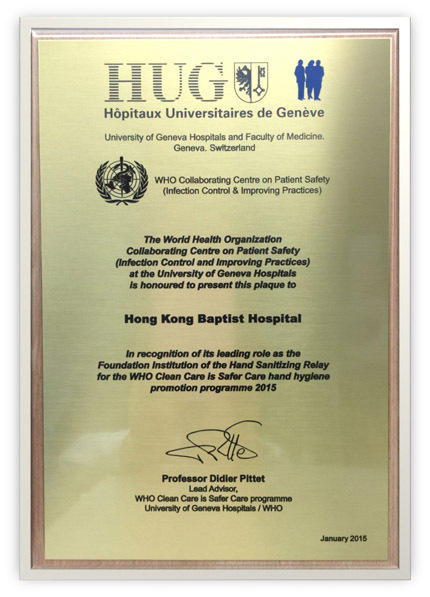 This is the 16th consecutive year since 2002 that the Hospital is honoured with the award of the Caring Organisation Logo for having demonstrated good Corporate Social Responsibility. The winning of this award is again a manifestation of HKBH's teamwork in the fulfillment of the strategic goal of social responsibility. 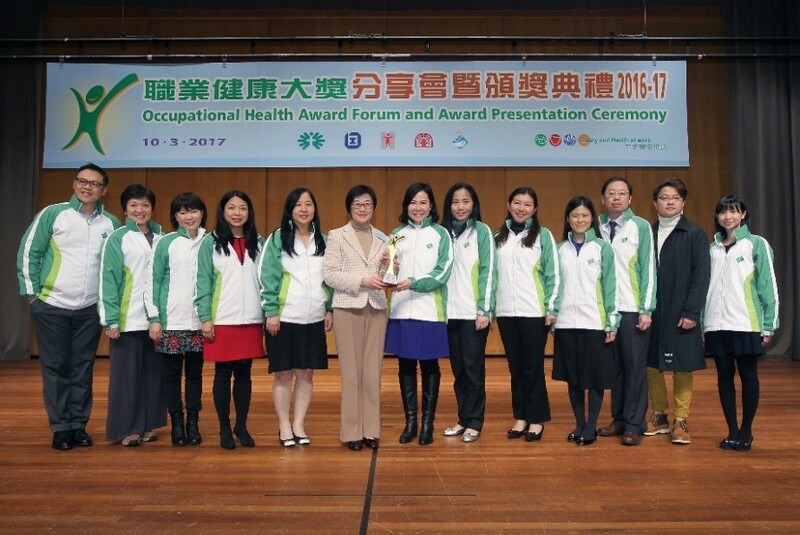 The Hospital received Excellence Award in Joyful@Healthy Workplace Best Practice Award category in Occupational Health Awards 2016-2017 jointly hosted by the Occupation Safety and Health Council, the Labour Department, the Department of Health, Pneumoconiosis Compensation Fund Board, and the Occupational Deafness Compensation Board. 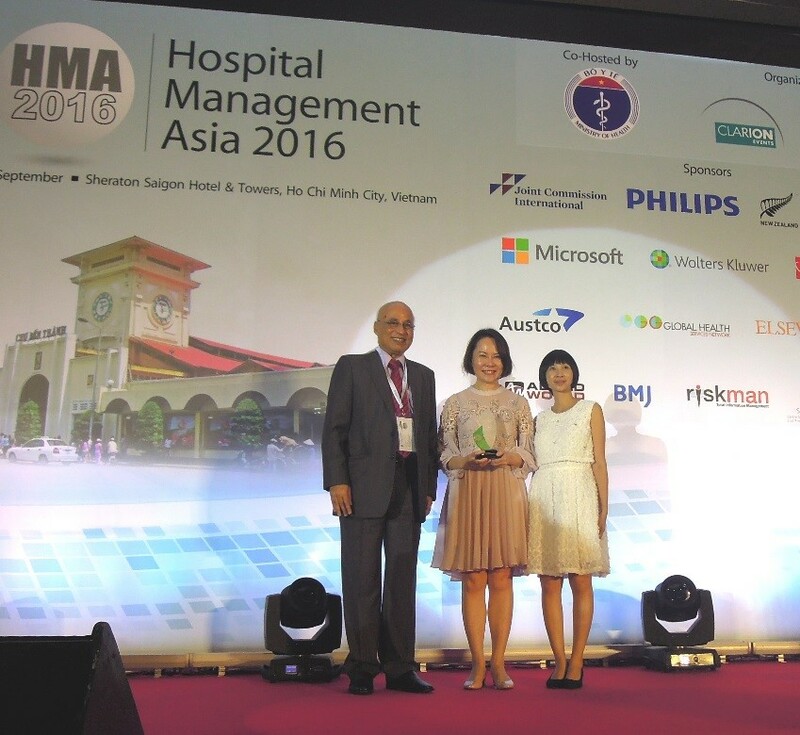 Received an Excellent Award in “Domestic Waste Minimization Program” at the Asian Hospital Management Award 2016 as a recognition of the Hospital’s achievements in resource recycling and waste reduction. 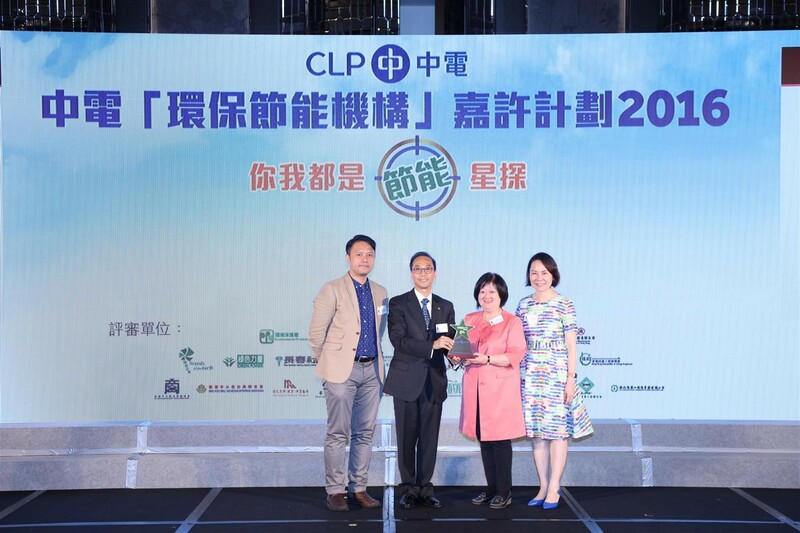 The Hospital became the first hospital in Hong Kong receiving the Gold Award in GREEN PLUS Award of the year 2016 (Public Organization & Utility) by CLP. HKBH was recognized by Mandatory Provident Fund Schemes Authority for our efforts made to provide better retirement benefits for ouremployees other than fulfilling the responsibility under the law. 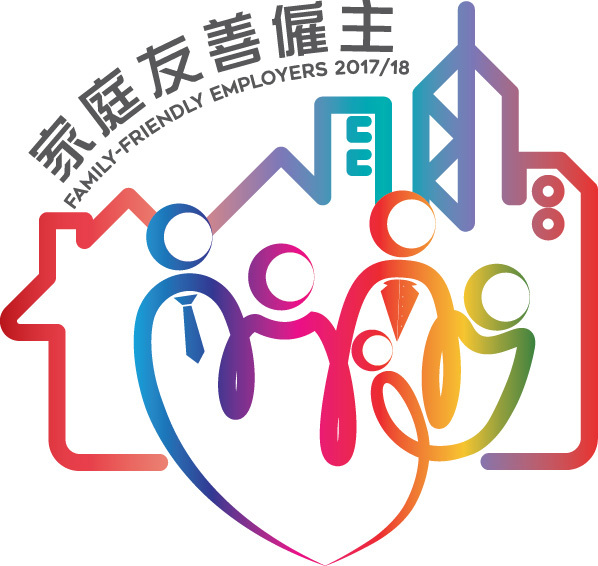 HKBH has been awarded the "Meritorious Family-Friendly Employers 2017/18" & "Special Mention (Gold) 2017/18" by the Family Council in recognition of the Hospital's practices in the implementation of family-friendly employment policies by adopting various job-related and outside-the-workplace family-friendly employment practices that enable employees to undertake the family commitments and balance work-family life. 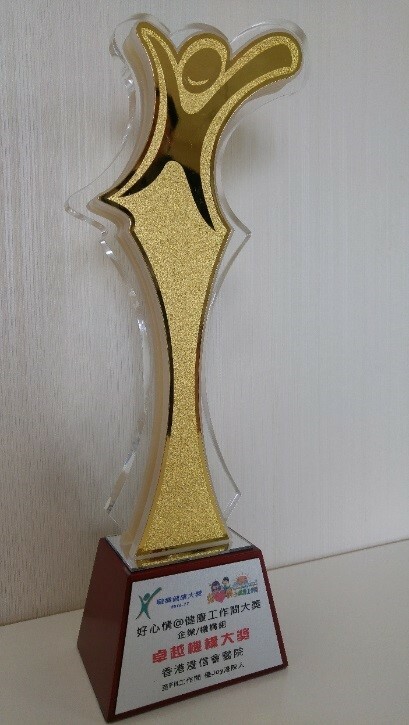 Ms Grace Wong, General Manager, represented HKBH to attend the GOALS Awards Presentation Ceremony. 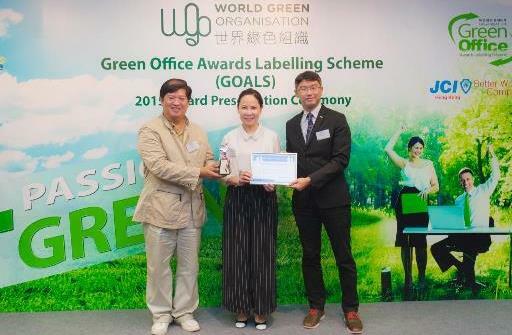 The office of HKBH located at Enterprise Square in Kowloon Bay participated in the Green Office Awards Labelling Scheme (GOALS) organized by the World Green Organisation (WGO) and was awarded with “The Better World Company” logo under the United Nations Milennium Development Goals and the GOALS logo by WGO. 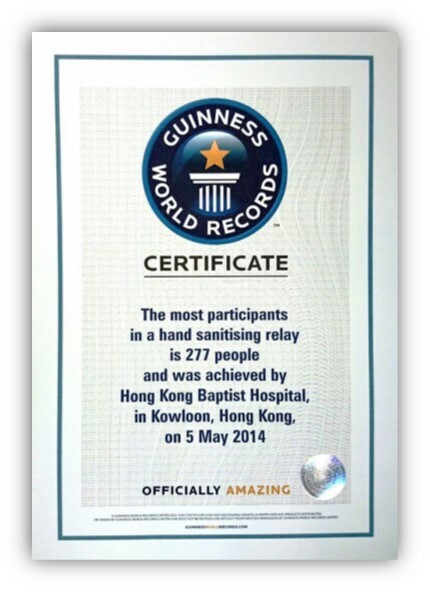 Following the making of its first Guinness World Record on "Hand Sanitizing Relay" in 2014, HKBH was accredited as the Foundation Hospital by World Health Organization of this "Hand Sanitizing Relay" model, which became the focus of the Hand Hygiene Day in 2015. HKHB participated in the "Earth Partner" 2014-2015 programme organized by Friends of the Earth to work hand in hand with the community to build a greener future. 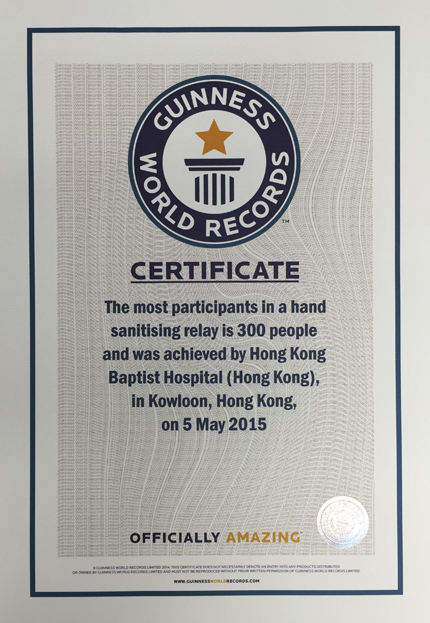 Following the making of its first Guinness World Record on "Hand Sanitizing Relay" in 2014, HKBH achieved the second Guinness World Record with 300 participants including students and senior members from our Au Shue Hung Health Centre performing hand hygiene at the hospital. 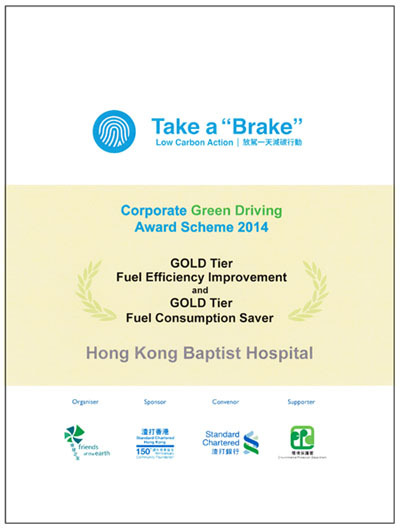 HKBH won the Gold Tier on Fuel Efficiency Improvement and Fuel Consumption Saver in Take a "Brake" Low Carbon Action – Corporate Green Driving Awards Scheme organised by Friends of the Earth (HK), for its outstanding performance in promoting a green environment. 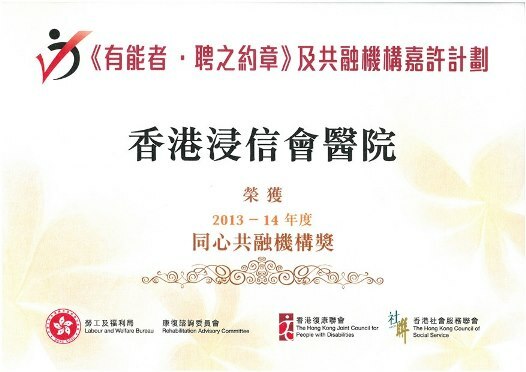 HKBH participated in the Talent-Wise Employment Charter and Inclusive Organisations Recognition Scheme organized by the Labour and Welfare Bureau, in collaboration with the Rehabilitation Advisory Committee, the Hong Kong Council of Social Service and the Hong Kong Joint Council for People with Disabilities. It was awarded as Partnering Inclusive Organisation and granted Inclusive Organisation Logo in recognition of achievement and efforts in implementing the scheme and promoting the employment of persons with disabilities. 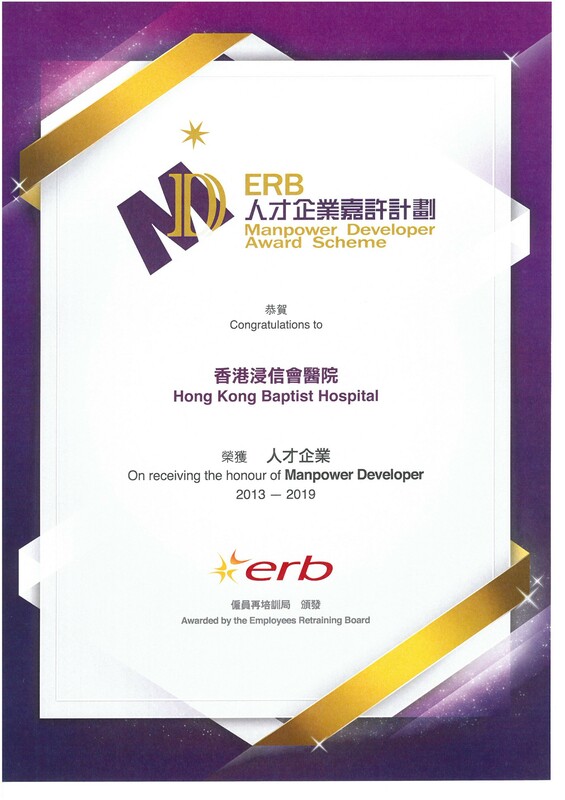 Hong Kong Baptist Hospital is honoured to have been awarded as “Manpower Developer” (MD) in the “Manpower Developer Award Scheme” organized by Employees Retraining Board (ERB) for the third time since 2013. 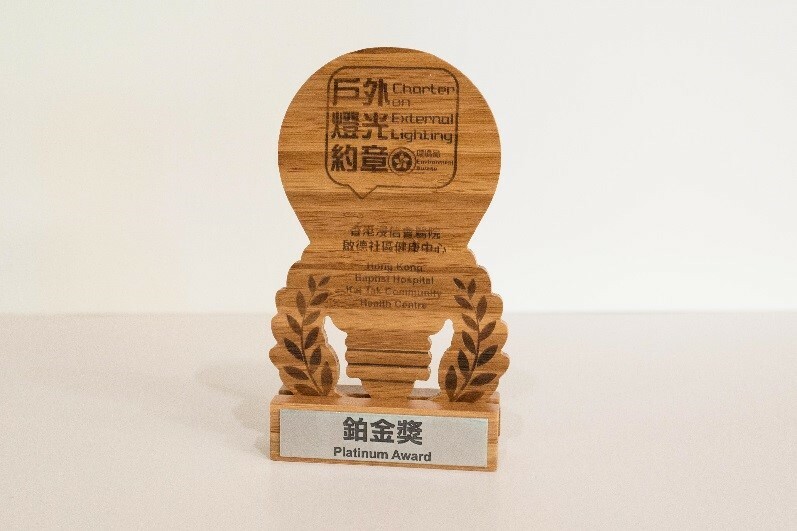 It is the first accreditation system in Hong Kong to assess the level of maturity of manpower training and development strategies and practices of organizations. 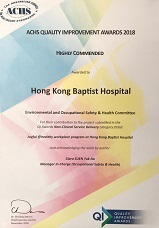 The award serves as a recognition of HKBH’s success in providing diversified training and development programmes for staff to cater their operational and professional needs. 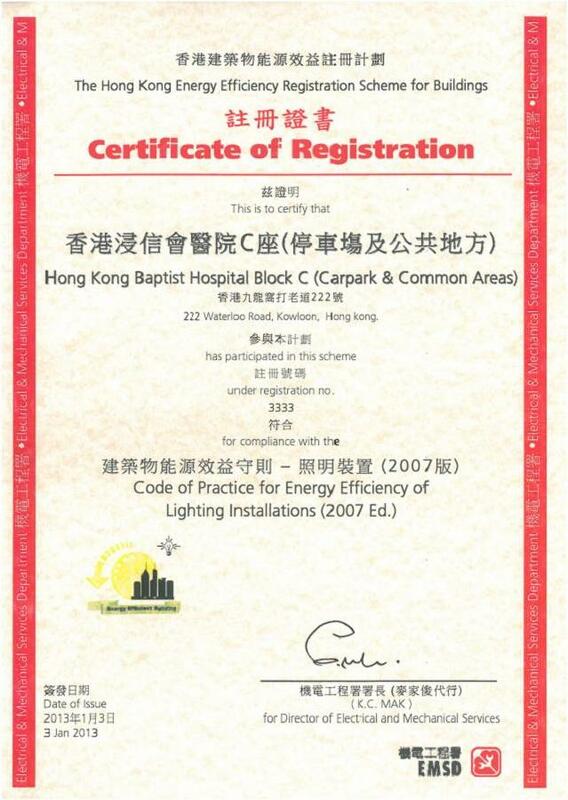 HKBH adopted a range of energy efficiency measures, and was granted the registration certificate of "The Hong Kong Energy Efficiency Registration Scheme for Buildings" by the Electrical & Mechanical Services Department for complying with the Building Energy Codes (BECs) standards in lighting installations at the Carpark and Common Areas in Block C.
HKBH is again awarded full accreditation on all 47 categories by the Australian Council on Healthcare Standards (ACHS), with Infection Control and Blood Management achieving Excellent grading. 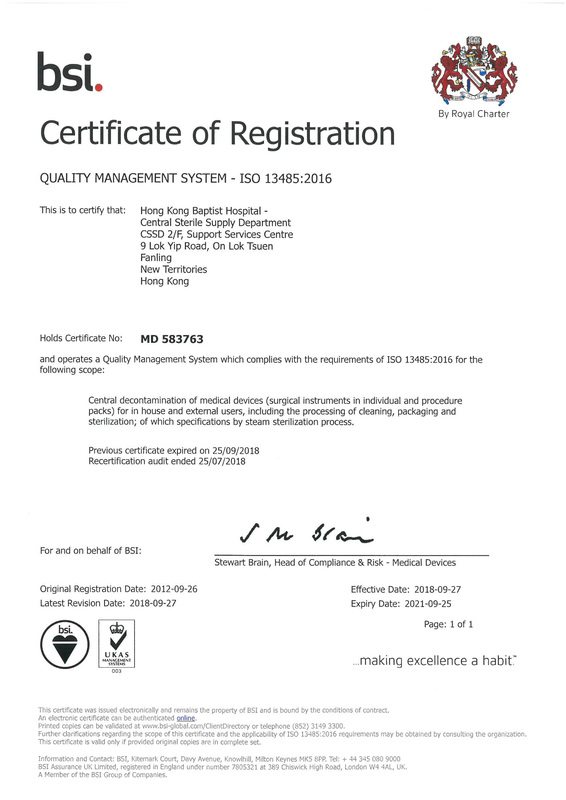 The Central Sterile Supply Department (CSSD) of HKBH was accredited ISO 13485 by British Standards Institutions (BSI), demonstrating its exceptional quality in management and regulatory system. 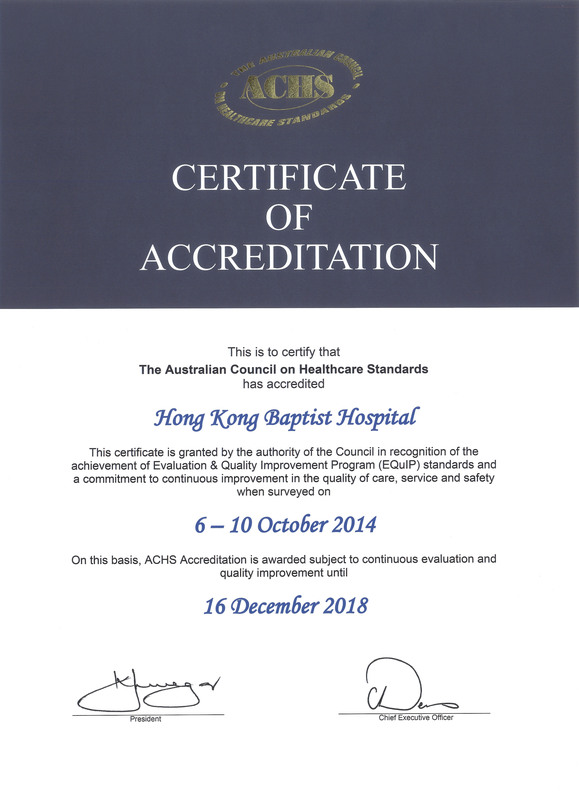 For the first time, HKBH took part in the Australian Council on Healthcare Standards (ACHS) survey and was awarded full accreditation for four years by ACHS. The Hospital has passed all the 45 criteria, and received 11 "Extensive Achievements" for its excellent level of performance. 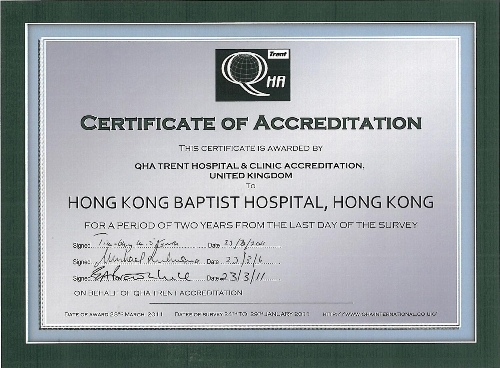 HKBH participated in the biannual survey under Trent Accreditation Scheme since 2000, and was awarded accreditations by the Trent Accreditation Board consecutively.